The 5 Minutes for Moms Ultimate Blog Party 2009 has begun. It runs through Friday, March 27, 2009. The Ultimate Blog Party is basically a place for online friends to meet and mingle. Using Mr. Linky, bloggers can access a whole list of links to other bloggers who share similar interests. Since this is my first year of being BloggyMom, I decided to participate as well! I am a working mom of one who started BloggyMom because I have realized that since having my little one, I was always making suggestions and sharing mommy tips & tricks that I have discovered along the way. And even more... the people I shared them with actually listened! I was born and raised in South Carolina. I left for about a year and a half when my husband was stationed in Fort Hood, Texas. I met some really great people down there who got me through a tough deployment and will remain my friends for life! After Texas, I wanted to be close to my family, so we moved back to South Carolina. Eventually we'd like to relocate to our hometown of Aiken so that our little one can be close to her grandparents. I'm grateful to my best girlfriends who let me vent and keep me sane! I have an awesome family, and a husband whom I love to pieces. My daughter is my pride and joy though at times she makes me want to pull my hair out- but then what mom of a 2 year old doesn't feel that way at some point? I love to watch reality tv, much to my husband's dismay. I usually DVR the shows...oh, I heart DVR too!... and watch them when he is working. I enjoy taking day trips with my family and short weekend trips with my husband. We'd love to go on a cruise someday! I also like shopping... I love finding great deals...it's like a treasure hunt! I've recently learned to sew and enjoy making dresses for my little one. I also make tulle tutus. I do some freelance design work...mostly stationery- invitations, announcements, business cards, etc. I'd like to learn some basic web design soon! Something that I would love to do someday is travel the US by rail. 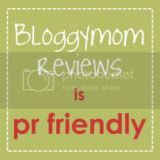 One of the things that I would really like to do with this blog is network with other blogging moms throughout South Carolina. Since I review products on this blog, I'd really like to connect with South Carolina business women and help promote their products. Name one thing on your "bucket list" - it can be anything...from simple "dance in the rain" to outrageous "ride a roller coaster naked" to seemingly impossible "Host Saturday Night Live"
Congratulations to Jennifer K., sphinx63 and Mommyhood is Thankless! Ladies, be sure to send me your mailing information by Wednesday, March 25th so I can get your prizes sent to you! Thanks to everyone who entered! Be sure to sign up for my current giveaways (see sidebar) if you haven't already done so! Congratulations to Meg and Rashmi! Ladies, be sure to send me your mailing information by Friday, March 20th so I can get these in the mail to you! Thanks to everyone who entered! I have lots of new giveaways in the pipeline so keep checking back! Remember that the great folks over at evolve are still offering 25% off your showerhead purchase through May 1, 2009! Enter coupon code TB25 at checkout! I would like to apologize...it has been a week since I last blogged. Last week was one of those weeks...you know the kind...when life catches up to you and the only thing you can really do is push through it. Not to mention that the time change really threw our entire household for a loop! We are still trying to re-adjust to that and work out a new bedtime schedule for the little one! In my next post I'll be reviewing a personalized children's book from Frecklebox. Frecklebox is a great company that makes personalized items for kids! Check back for that review...there may be something in it for you too! Also, don't forget to enter my current giveaways; both are ending this week. I recently received a Fiber One Spa Break Gift Basket courtesy of my friends over at My Blog Spark. The theme (besides spa) was chocolate. Who can resist that theme?!?! Since I love chocolate, I was super excited to receive my gift basket! The first time I tried the Fiber One Chocolate Mocha Chewy Bars, I really liked them. The coffee taste is not that strong at all. And the chocolate and chewiness outweigh the bit of coffee taste that you get. The second time I had one I didn't even taste the coffee! Now, the Fiber One Chocolate Mocha Chewy bars are my daily afternoon snack! Seriously people, these things are GOOD. Chewy! Chocolate! YUM! Now that your mouth is watering, I'll tell you that the people at My Blog Spark were kind enough to offer me additional Spa Break Gift Baskets to give away! The basket will have a bath pillow, chocolate scented soap, lotion, and bath salts, and a coffee scented candle along with a coupon for a FREE box of the NEW Fiber One Chocolate Mocha Chewy Bars. The contest will run now through 10 pm Friday, March 20, 2009. I'll award gift baskets to THREE lucky readers. Winners will be notified on Monday, March 23, 2009. Contest is open to US and Canadian residents. 2) Comment about a Fiber One product (other than Chocolate Mocha Chewy Bars) that you have tried or would like to try. Blogging about this contest OR posting this contest on your facebook page will earn you one extra entry. You must actually blog about the contest, not just paste a link. Comment about one benefit of fiber for one extra entry. Check out the Fiber One Recipes and let me know one you'd like to try- I'll give you one extra entry. That gives you a total of 4 possible entries. Leave only one comment to complete the required entry. For each optional entry you complete leave a separate comment. Also, check out this link for downloadable $1.35 coupon for Fiber One Chewy Bars! Be sure to check out my other giveaways as well! In this economy, who isn't looking for ways to save money?! And while you're at it, why not conserve water too??!! A revolutionary product from evolve does just that! evolve shower heads are maximum flow, eco friendly shower heads that use ShowerSmart technology to help you conserve water and save money. Say what?!?! Yes, it's true. But how does it work? AND really, how does it work? Thanks to my pal Chevon over at evolve I had the opportunity to try out the water lily rain shower head. First, installation of this shower head was quite simple. That's great, you say, but how exactly does a shower head save me money? And how much money are we talking here? Yeah, but how much does it cost? The evolve shower head that I tested is the "water lily" Rain Shower head. This shower head retails for $80, other rain models retail for $60-$110. evolve also has standard ($40-$90) and handheld ($70-$130) shower heads available. I feel that these prices are comparable to shower heads that one would purchase at Lowes or any other hardware store. So how can I get one? You can order directly from the evolve website, here. Use coupon code TB25 now through May 1, 2009 and save 25%! Also, thanks to my friends over at evolve, TWO lucky readers have will win a Water Lily rain shower head ($80 value). That's right, you could WIN AN EVOLVE SHOWER HEAD of your very own! Part 2... One of the things I love about evolve is their philosophy- this eco-friendly company has pretty much the same outlook as you and I in concerns to being "eco-friendly." For the second part of your entry, head over to evolve and take a look at their vision. Come back here and tell me one of the beliefs that you read about that struck you. Do not comment on the same belief as the person directly before you. The contest will end at 10 pm on Monday, March 16, 2009. Winners will be chose via random.org. You can earn up to 5 extra entries when you bring friends to my blog! Simply inform your friends about the contest (how you do this is up to you) and invite them to follow my blog. If they become a follower at your suggestion, they must leave your username or a link to your blog in a comment. To enter the contest themselves, they must follow the same rules above. You can invite as many friends as you like, but only the first 5 to become followers will count towards your extra entries. You can earn 2 more entries by leaving relevant comments to any other posts on this blog. You do not need to comment that you left a comment- I'll see that when I approve it. You cannot leave two comments on the same posts and the comments must be relevant to the post. That's a total of EIGHT possible entries to win one of two evolve shower heads that I am giving away! ******UPDATE 3/3/09******** I have an AWESOME savings to pass on to you! evolve has agreed to give my readers 25% off of their next purchase! Use coupon code TB25 now through May 1, 2009 on your purchase and save 25%! Thank you to Sweeties Sweeps for posting my giveaway.